If you really want to uncork something special, Cork flooring may be the type of flooring for you. 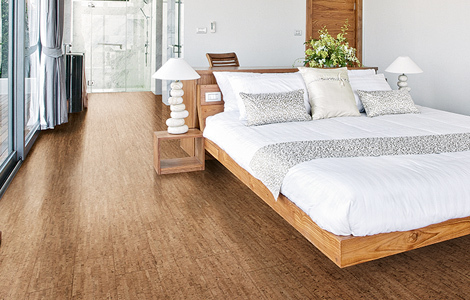 Being durable, quieter, and having an easy upkeep makes Cork flooring perfect for any room residentially as well as commercially. It can withstand years of wear and insulates from extremes of heat and cold. This type of flooring also is shock absorbent making it easier on your legs, joint and back while also being environmentally friendly withstanding mold, mildew and moisture. Cork flooring reduces noise and sound transmission between floors and the only things needed for cleaning and maintaining are a vacuum cleaner and microfiber mop. Installation for this type of flooring is also a breeze in which they can be installed over hard, level surfaces and are just clicked together as a floating floor. They can be cut easily to conform to any room dimension and have micro beveled edging.